Preseason capsule information for the area’s boys soccer teams, as submitted by coaches. Outlook: The Lions jump back into the Sunset League, and with seven starters returning, they hope to compete for a postseason berth. Outlook: The Aggies bring back seven starters from a team that narrowly missed out on the postseason. “With a lot of upperclassmen, we hope to have great leadership and have a chance to make the playoffs,” Starbird said. Outlook: The defending Southwest League champions bring back six starters, including some firepower in Neville (12 goals, 6 assists) and Daseler (6 goals, 5 assists). Madsen (4 goals, 2 assists) also should contribute. Wright (3 goals, 1 assist) is back to guide what should be a strong defense. Tate feels the addition of freshman goalkeeper Diesel Fiore also should strengthen the defense. The Gaels have veteran starters back in the midfield. Outlook: The Bengals narrowly missed out on a playoff berth last season. With 10 starters back, though the team remains young, they should compete for a spot in the postseason. Outlook: Langager takes over a team that has plenty of varsity experience. In all, 11 lettermen return for the Pioneers, who have some weapons at forward and in the midfield in Quintero (9 goals, 2 assists), Muniz (4 goals, 3 assists), Gonzalez (3 goals, 3 assists), Donate (2 goals, 4 assists) and Urias-Medina. “The team is playing well together and has high expectations for itself for the season,” Langager said. Outlook: Mays, who recorded eight shutouts last season, is one of eight starters who return for the Bulldogs. “I’m really looking forward to the 2017 season,” George said. “We have a very talented group of seniors as well as a group of younger guys who have proven to be able to step into specific roles and compete on a very high level. Outlook: Graduation took its toll on the Cowboys’ roster with eight starters gone from last year’s squad that advanced to the Class 3A state tournament. Mendoza, the Class 3A state defensive player of the year, and teammate Grossi return to guide the defense. Caro (5 goals, 3 assists) should be among the leaders on offense. Outlook: The winners of the last four Northwest League titles, the Spartans return seven starters but will have some work to do in replacing two players who combined for 48 goals and 19 assists in their senior season. Garcia (8 goals, 4 assists) missed last season due to injury, but returns to help an offense that also should get contributions from Villasenor (4 goals, 5 assists), Rubio (3 goals, 8 assists) and Andrade (3 goals, 4 assists). “We expect to be up to the challenge, returning a solid core of veteran players with a few new additions,” Bailey said. 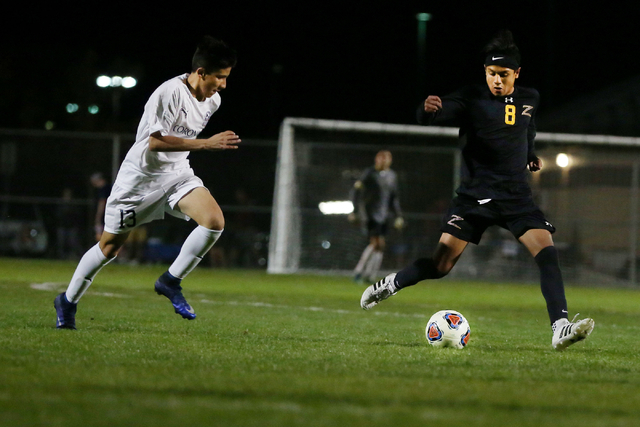 “Gustavo Garcia returns after missing his entire junior year to injury and looks to thrive in a starting role after scoring eight goals as a sophomore. Miguel Rubio and Kevin Romero will pickup where they left off last year with solid play. Outlook: The Cougars came up a goal short of winning the Class 4A state title last season, taking Galena to overtime before falling. Seven starters return from that team, including Lynam, who had 35 goals and 22 assists. “After losing key seniors, we will look to rebuild and make a run in the playoffs,” Barton said. Outlook: The Dragons put together a fantastic season last year, going undefeated until the Southern Region semifinals. The loss of 10 seniors from that squad won’t be easy to overcome. Calderon (14 goals, 7 assists) and Barajas (3 goals, 5 assists) are back to lead the offense, and Carranza returns to guide the defense. “Gaining experience and playing spoiler in the playoffs is our goal,” Britt said. Outlook: Magdos takes over a team that is hungry for success. The Diamondbacks bring back 12 lettermen and hope to compete for a playoff spot. Outlook: The Trailblazers returns six starters from a squad that advanced to the Class 4A state tournament last year. Munguia (16 goals, 2 assists) led the team in scoring last season. Outlook: Five starters return for the Sundevils, who will field a young team. “With only four seniors, Eldorado looks to grow as a program around a young core of talented cousins, sophomores Roberto Soto and Roberto Gonzalez,” Ostler said. “In order to compete for a playoff spot this team will have to mature quickly and find ways to score. Leonel Sedano and Fransisco Ulloa will be asked to set up and provide that scoring. Outlook: After finishing second in the Southeast League last season, the Falcons return 12 lettermen. Milne (9 goals, 7 assists) was the team’s second-leading scorer, and Henderson (4 goals, 1 assist) the fifth-leading scorer last season. “With six returning starters, we will be rebuilding,” Risheg said. Outlook: Uribe (10 goals, 9 assists) will be among the leaders on offense, and Scott (7 shutouts) is back to anchor the defense for the Gators. “This year’s team features nine new players to the team and has four starters back from last year,” Rivera said. “Our team is young, but we are working toward being a cohesive group and will look to develop chemistry in the beginning of the season. Outlook: The Longhorns bring back most of last year’s team, a year wiser and more experienced. Outlook: The Patriots return 14 lettermen from a squad that qualified for the Sunrise Region playoffs last season. Outlook: The Mustangs are restarting their program after not fielding a team last season. Outlook: The Pirates finally have experience on their side with seven returning starters. Rubio (10 goals, 2 assists) and Robles (5 goals, 4 assists) should be among the leaders up front with Lee helping to guide the defense. “This will be one of the most experienced varsity teams Moapa has had in the last six years,” Bushman said. “The seniors are motivated and intelligent, and there are some talented underclassmen. Outlook: The Panthers return six starters from last season, including their offensive firepower. Manthey (18 goals, 18 assists), Robledo-Matadamas (15 goals, 10 assists), Stephens (12 goals) and Montoya (5 goals, 1 assist) all return as strikers with support from Ruffer (4 goals, 4 assists) and Vogel (3 goals, 6 assists) in the midfield. Outlook: The Mustangs return 14 lettermen from a team that qualified for the Sunset Region playoffs last year. “With 12 seniors, six returning starters and 14 returning players, this will be the most seasoned team I have had here,” Lavoie said. “The Northwest League is extremely strong from top to bottom, so surviving league play and trying to make the playoffs will be our focus. Outlook: The Mountain Lions’ sixth-place finish in the Southwest League last year is deceiving as the team was just three points out of third place and narrowly missed a playoff berth. Thirteen players return from that squad. Perez (14 goals) and Erwin (3 goals, 4 assists) should be among the leaders on offense. McCree (3 shutouts), Prescia and Perez are back to guide the defense. “We are a senior-heavy team that is looking to get into one of the playoff spots in the Southwest League,” Quinn said. Outlook: The Skyhawks bring back the bulk of last year’s team and hope to improve on their results. “We look to build on the steady improvement this program has seen over the past couple of seasons,” Cenatiempo said. Outlook: The Eagles will make their debut this season. “This year we hope to build on the foundations of a team capable of competing with other high schools in the state,” Guderian said. “As it’s our inaugural season in the NIAA, we’re looking to focus on and create a team that is dedicated to the sport, and shaping successful student-athletes that are proud to be an Eagle. Outlook: The Miners graduated a big senior class, including the team’s top two scorers who combined for 57 goals last year. Still, there’s plenty of talent in the fold for the defending Sunset League champions. Jimenez was third on the team in scoring last year with eight goals and 11 assists. “Sunrise Mountain expects to contend for both the region and state title in 2017,” Mohrbacher said. Outlook: The Grizzlies raised some eyebrows in their return to Class 4A last season, finishing third in the Southwest League. With 14 lettermen back, the team appears to be primed for success again this season. Outlook: The Roadrunners bring back plenty of experience with 13 returning lettermen. Mejia (8 goals, 4 assists), Gomez (6 goals, 6 assists), Aguilar (3 goals, 5 assists), Nunez (2 goals, 2 assists) and Lopez (2 assists) all should help the offense with Carmona, Nunez and Lopez guiding the defense. Outlook: Paylor inherits a squad that is hungry for success and returns six starters after qualifying for the postseason last year. Outlook: The Warriors bring back 12 lettermen from a team that advanced to the Class 3A state final last season. Estrada (15 goals, 5 assists) and Sunset League defensive player of the year Arredondo-Alvarez (7 goals, 4 assists) should be among the team’s leaders. “The goal remains the same: Be the best team in Nevada in November,” Pippin said.